Red-headed flies (Bromophila caffra) are striking and common animals in East and southern Africa, but little is known about their biology. Two months, that’s how long I have been neglecting this blog. Some people had even sent me messages to check if I were still alive. 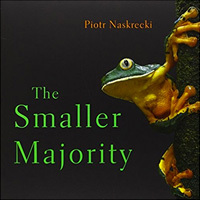 But I am alive and the reasons for my silence were good – until last week I was in Mozambique, working at the Wilson Lab and busily preparing for the next biodiversity survey of Gorongosa National Park. While there I had precious little time to write or take photos, but I did manage to take some shots of a few interesting critters. It is the rainy season in Gorongosa now and insect life is exploding. I had set up an ultraviolet light in front of my office to collect all members of my target groups (orthopteroid and dictyopteroid insects) and to cherry-pick the more interesting species from orders that we don’t yet collect systematically. On some nights the sheet was sagging under the weight of hundreds of species of insects and for a while mysterious redheads kept coming to the light. 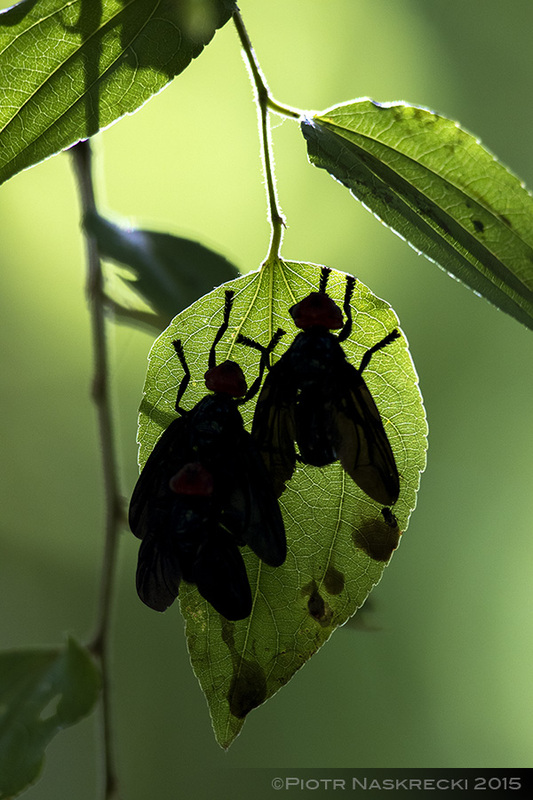 Red-headed flies, which in Mozambique emerge at the end of the rainy season, like to hang in clusters on leaves. I recognized them from my earlier trips to Gorongosa as Red-headed flies (Bromophila caffra) – large, slow moving insects, reluctant to take to the air, and much happier to hang in clusters from low tree branches. They are truly striking animals, showy and clearly unconcerned about attracting anybody’s attention, including that of potential predators. There were many birds and grabby vervet monkeys in the camp, who not so much as looked in the direction of the flies who slowly spun in clusters on leaves. Adult Red-headed flies feed on dung and other decaying organic matter. 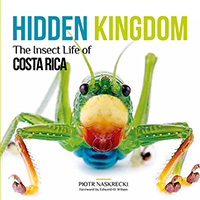 But for an insect as conspicuous and common as the Red-headed fly, shockingly little is known about its biology. In fact, the last scientific paper that mentions it by name (according to an extensive MetaLib cross-database search) is from 1915, and it does so only to compare the fly’s strikingly red head to another species. As already pointed out in an excellent post about this species by Ted C. MacRae, there exists only anecdotal evidence that the larvae of this species might be feeding on the roots of Terminalia trees, potentially sequestering toxic cyclic triterpenes, which would explain the adult flies’ aposematic coloration. 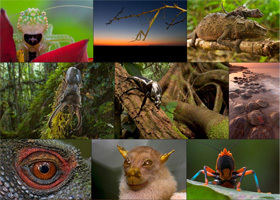 But, as is the case with so many African invertebrates, nobody really knows. There is also another possibility. 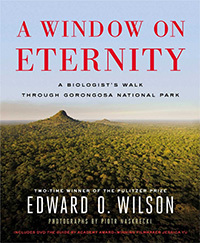 One morning while in Gorongosa I woke up to find my arms covered with big, painful blisters. The night before I had spent a couple of hours searching for insects in tall grass and remembered seeing many contrastingly colored, red and black beetles of the genus Mylabris. “Oh, that’s why they are called blister beetles!”, it dawned on me, a little too late. While walking through the grass I must have brushed against some of these insects, and a mere touch against my skin caused the blisters, which lasted for over a week, to appear. The beetles themselves are highly toxic, deadly even, and no bird or other vertebrate will try to eat them. It is therefore quite possible that the flies are fakers – not toxic at all but simply counting on predators’ reluctance to try a potentially harmful meal. This phenomenon, known as Batesian mimicry, is common in the animal kingdom and I strongly suspect that the flies are an example of it. I strongly suspect that Red-headed flies are Batesian mimics of blister beetles of the genus Mylabris. 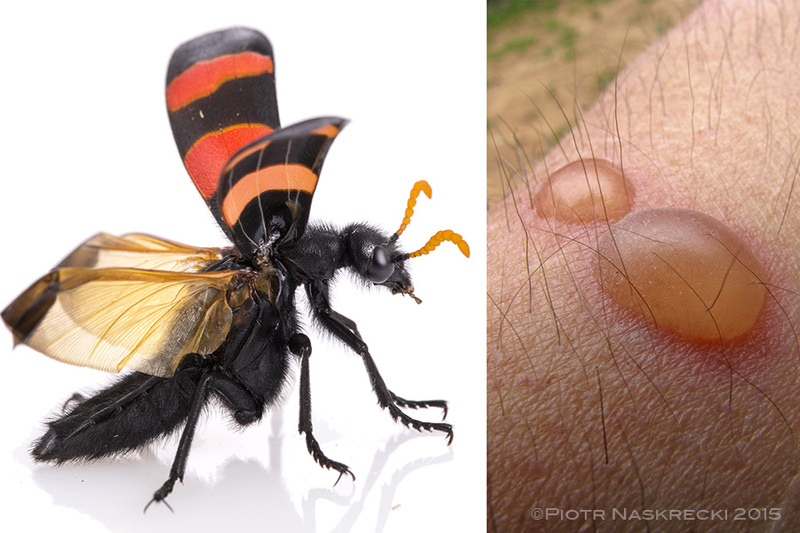 These beetles not only cause painful, long-lasting blisters but are also potentially deadly toxic. When I return to Gorongosa next month the flies should still be around. It will also be the time when many young house geckos (Hemidactylus mabouia) are hanging around the lights of the camp, having hatched in January and February. It might be a bit evil on my part, but I think I will do some feeding experiments to see if the lizards, which at that point should still be naive about the flies, have any adverse reaction to eating them. Watch this space. One peculiar morphological characteristic of the Red-headed flies is the absence of the ocelli, which are typically found on the head of other flies. Next Post Mozambique Diary: Photoshop or not? Ps live in West Florida! Just came home to my majestic palm covered in these red headed evil looking flies, when i pulled the branch down they just circled a little and resettled! Are they killing my palm? leaves seem to brown then fall. I do feel bad about killing it now but in the moment I didn’t know what it was. Are these dangerous in any way to humans? 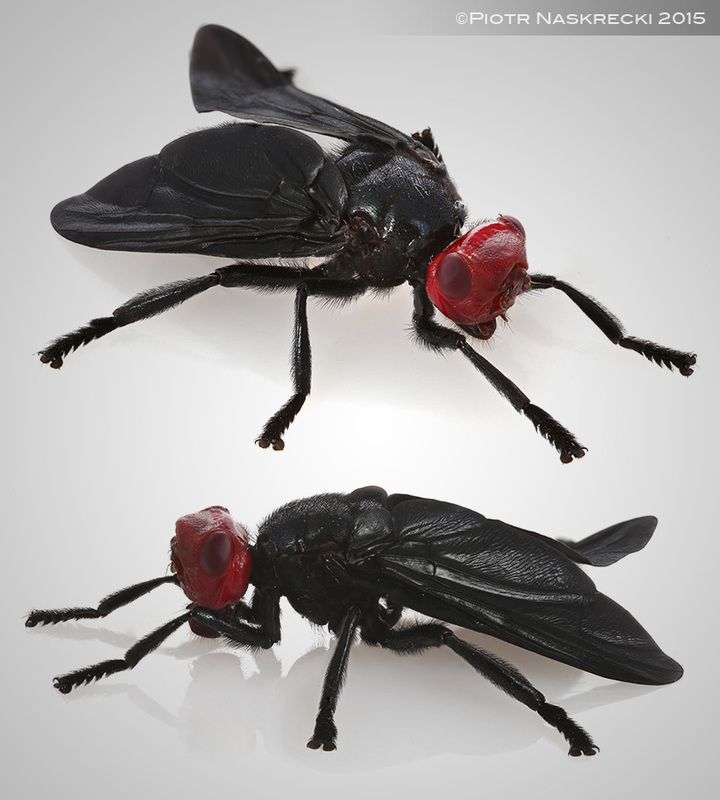 I stumbled across this article because I remember a fly/insect that looked a lot like this one when in my room on afternoon and I didn’t know what it was and had never seen one. I thought it was a mosquito so I got scared and killed it..
What should you do if you come in contact with one or get bitten by one what shell you do. you make, and so detect all your login details. in it) explained that he didn’t do much. Hi Piotr. I’m interested in knowing how big these flies are? They look huge, but it’s hard to tell as I don’t know the tree they’re on. Fascinating stuff! Piękne zdjęcia i opisy zjawisk. Aż miło poczytać dla przypomnienia i poćwiczenia języka przy okazji. I had my first encounter with blister beetles in Mexico after a successful night at the light sheet. I awoke in the early hours of the morning with blisters on arms and neck. Quite scary until I realised what had happened. Ed Ross was on the trip and took photos of my arms which are now somewhere in the Getty images photo library where all of his photos ended up. 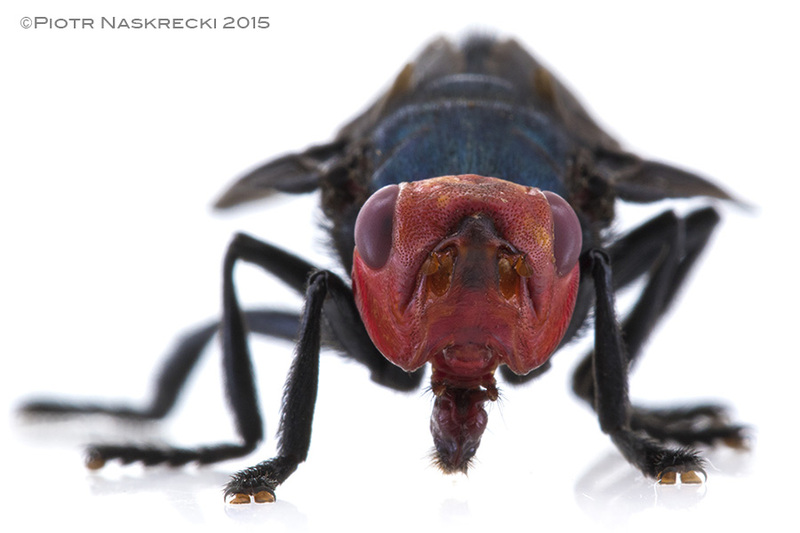 Those are lovely flies and their story is a neat one–to say nothing of your great photos. This species of fly is one of my favourites. I like their tameness and slowness. Their heads are really amazing. Very nicely illustrated here. 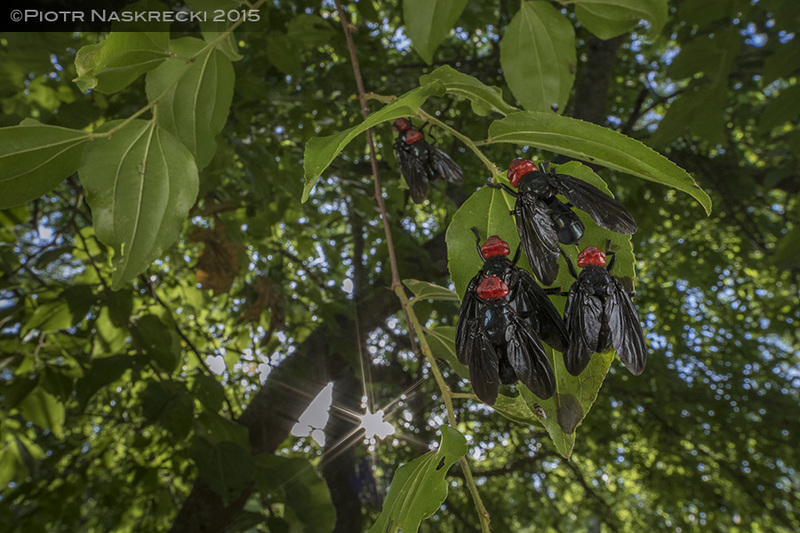 I agree the flies are Batesian mimics, but I always suspected the model to be black and red Pompilidae and Eumeninae. But I suppose the mimicry is rather broad. 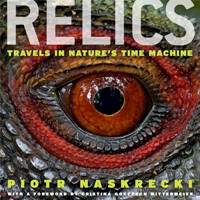 Piotr is alive … need not fear it … at least I respected that. Thank you for “being alive” and post more of an adventure / experience yours. No ocelli? Interesting. You describe the flies as unwilling to fly and predators are adverse to them. Do you think they lost the ocelli because they no longer need to keep an eye out for predators? what a scary fly !!! but beautiful pictures !! Very nice post, as usual. Good to have you back, Piotr! I can think of several Meloidae species that can fit the appearance of these flies. These species are from Israel though.. When I saw the photos I did not picture Mylabris as the model because they are usually striped/dotted with black and red on their elytra (I’ve never seen one with a red head). Perhaps a better example is something like Trichomeloe sericellus, a flightless meloid species. Do you have those in Mozambique? I don’t think it is that important whether the red color is on the head or a different body part. What likely matters is the contrast of the two colors. Another potential model is Synagris (which has a dark orange tip of the abdomen) or other wasps. Trichomeloe is a truly spectacular insect but unfortunately we don’t have them in Mozambique.